Costing almost double the price of the non-Neve version, this small format audio interface boasts a stellar sonic pedigree. Sitting somewhere around the middle of Steinberg’s range of audio interfaces, the UR242 is a no-frills 4-in/2-out USB 2.0 box featuring Yamaha D-Pre preamps and zero-latency monitoring with effects. The new UR-RT2 is basically the same thing, but with the remarkable addition of a pair of genuine Rupert Neve... transfomers to the main inputs. You thought we were going to say ‘preamps’, right? Well, sadly not - a full Neve pre would presumably have pushed the price too high. However, the input (and, indeed, output) transformer of any preamp - assuming it has them, as they don’t have to - plays a very important and beneficial role in its colouration and, ultimately, sound; and that famous ‘R’ on the UR-RT2’s fascia makes an undeniably attention-grabbing first impression. For the last 50 years or so, the Neve name has been synonymous with high-end preamps, compressors, EQs and mixing consoles, and this is the first time founder Rupert Neve, who’s very selective about where the company places its circuitry and electronics, has elected to collaborate in the design of an audio interface. That’s a pretty big deal in itself, and we’re delighted to see the partnership come to fruition, even if it’s currently restricted to the confines of a ‘workhorse’-style interface, rather than an entirely new and more fittingly ‘special’ unit. The transformers are a custom design specifically for the UR-RT2 and its larger sibling, the UR-RT4 (£558), which is similarly built on the foundation of the existing UR44. The D-Pre preamps they feed into are the same as those in all UR interfaces, based on an inverted Darlington design that uses four transistors, instead of the usual two, to enable very high levels of input gain without distortion. The all-metal, reassuringly solid UR-RT2 just about qualifies as a mobile interface, being quite heavy (1.7kg), fairly large (198x208x47mm) and externally powered (PSU included). It’s compatible with Mac, PC and iOS, the last using Apple’s Camera Connection Kit or a USB2-to- Lightning cable. The front panel is home to the two main XLR/ jack combi inputs. In 1 accepts mic, line or instrument level signals, with the Hi-Z button flipping between the latter two when a jack plug is inserted; In 2 offers only mic and line. Each of the two inputs has its own Gain knob, but phantom power is provided to either both or neither, via a switch at the back. The 1/4" headphone socket has its own level knob, and peak LEDs light up with input overs. The two buttons above the Gain knobs switch the Neve transformers in and out - we very much like that they can be disabled/enabled independently, so you can still go for the untinged D-Pre sound when you want more (if not total) transparency. The software bundled with the UR-RT2 (and UR-RT4) comprises Steinberg’s Cubase AI DAW for Mac and PC, a code for Cubasis LE, and the DSPMixFX UR-RT latency-free mixer application. The two DAWs are handy throw-ins, certainly, making the UR-RT2 all you need to get started recording. DSPMixFX, on the other hand, falls somewhat short of what we've come to expect from a mixer app these days, especially one attached to an audio interface at this price point. It's designed to facilitate zero-latency monitoring with effects, and to that end, it includes a small suite of plugins running on the internal DSP: a combination compressor/EQ, a set of guitar amp sim and a reverb. None of them are anything to write home about, but for real-time cue monitor processing, they're quite handy. DSPMixFX itself offers level, pan and reverb send controls, as well as phase invert, Mute and Solo for each of the hardware’s four input channels, with another input channel for your DAW (for mixing it with the direct monitoring signal). It’s utilitarian at best, but it gets the monitoring job done. And if you're using the UR-RT2 with Cubase, all of this is built into the DAW, so DSPMixFX isn't something you'll have to deal with at all. Round the back are two more balanced 1/4" line level inputs and a pair of balanced ‘main’ line outs for hooking up to your monitors, plus MIDI In and Out 5-pin DINs. The level control knob for the main outs is next to the headphone control at the front. 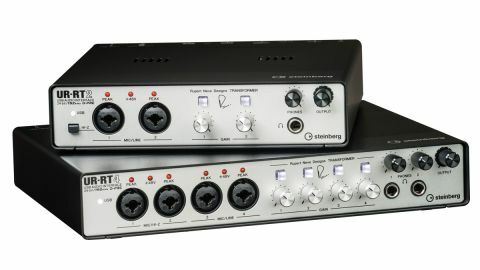 The UR-RT4, incidentally, expands on this with two mic/line ins and two mic/instrument ins on the front panel, (all four with Neve transformers), four more line outs at the back, and a second headphone jack. Performance-wise, the UR-RT2 operates at up to 24-bit/192kHz, with a dynamic range of 101dBA. At 44.1kHz sample rate, latency is a thoroughly average 7.82ms round trip at a buffer size of 64 samples, 28.1ms at 512 samples, and 51.4ms at 1024 samples. There are faster interfaces on the market, but the UR-RT2 is by no means slow in the grand scheme of things. So what about those transformers - do they really make a difference? Of course they do; they're Neve! Classy and flattering in their harmonic enhancement, they bring a fullness and warmth to vocals, basses, guitars and electronic sounds, and add a touch of punch and weight to drums. The D-Pre isn't the flattest of preamps (we mean that in a good way! ), so we'd imagine a lot of work went into tuning the transformers to compliment it; and having the option to switch them in and out, for two subtly different recording flavours, is really cool. OK, so what we have here, as stated at the top, really is the UR242, which retails for just over half the price (£188), with Neve transformers worked into the preamp input. Whether or not the UR-RT2 represents good value or not is hard to say, as Steinberg and Neve are breaking new audio interface ground here, but the influence of the transformer on the sound is a definite plus. We’re quite surprised transformers haven’t also been placed at the preamp outputs, to imbue even more of that delicious Neve vibe, but there are all manner of possible reasons for that, and there’s certainly nothing to complain about with the quality of Yamaha’s D-Pre preamp. Hopefully, Steinberg is planning a rather posher second tier to the RT line, as it would be great to see those transformers in a higher-spec interface with more I/O, and USB-C or Thunderbolt 3 connectivity. Right now, though, while the excessive weight of the thing is a bit of a shame (you'll definitely feel it in your backpack) and we're not exactly blown away by DSPMixFx, this is a quality audio interface with a truly authentic and meaningful USP.